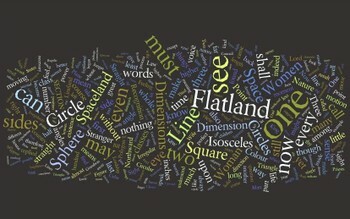 Word Art: the Geographical Vocabulary of Edwin Abbott's "Flatland"
Edwin Abbott’s slender Flatland, a Romance of Many Dimensions is perhaps one of the best books ever written on perception and dimensions, a beautifully insightful book that was quick and sharp, and in spite of all that was also a best-seller. Written in 1884 when Abbott was 46 (Abbott would live another 46 years and enjoy the book’s popular reception), it introduces the reader to a two dimensional world with a social structure in which the more sides of your object equals power and esteem. Thus the lowest class would be a triangle (three sides) while the highest (priestly) class would be mega-polygons whose shape would approach a circle. Abbott’s magistry comes in explaining to the three-dimensional reader what it was like to be in a two-dimensional world. Word Cloud: The 236 Different Words of "The Cat in the Hat"
I've also constructed a Wordle of the entire document to see if anything interesting popped out, though the secret of interest remained hidden. Every December the online intellectual salon called Edge, presided over by literary agent John Brockman, asks a select (virtual) assembly of scientists to ponder a question, such as what they are optimistic about (2007), what "dangerous" ideas they have (2006) and what they believe is true but cannot prove (2005). As the bell tolls on 2008 and rings in 2009, Edge is unveiling this year’s: "What game-changing scientific ideas and developments do you expect to live to see?" Science Writer, Author, What Is Life? Beginning life with the final kiss of a Shakespearean comedy is far more complex than it is interesting. The ordeal of Benjamin Button, a current movie based on the 1922 short story by Scott Fitzgerald (found in his collection Tales of the Jazz Age), presents some very curious aspects of the physics of life--especially if it is more than just Mr. Button who gets to live their life out again in reverse. It also isn't a very wide genre of literature, so far as I know. Another good example of a life lived backwards is the book Time's Arrow, by Martin Amis, who tells the story of a problematic character named Tod T. Friendly. ("Tod T. Friendly" is also "Todt Friendly" or "death friendly, taking a piece of his name from German, which evidently Mr. Friendly was.) On the other hand, the novel Stuart, a Life Lived Backwards doesn't make the cut, as Stuart does live his life forwards. Christopher Homm, (homme?) written by C.H. Sissons in 1965, tells the story of the title character backwards, though his life is lived forwards as well. The idea of the future, or the having of a future, seems like it should be an ancient idea, and it is--though it isn't necessarily a universal idea. Mesopotamians, Babylonians, Mayans embraced the idea of vast distances of time; early Christian faith, o the other hand, doesn’t necessarily have a great future, what with time ending at Judgment Day. Hinduism and Buddhism have a sense of the future, though there is some very problematic circularity involved with it. The true scientist bits about the concrete possibilities of vast amounts of time extending into the millennia are found in Charles Lyell (Principles of Geology) who in 1830 took up some earlier work and made it possible to think of the age of the earth in terms of millions of years. Charles Darwin was also a cultivator of the past and possible future, as was Hermann von Helmholtz, who predicted the ultimate age of the sun, meaning that time's arrow had the possibility of being hundreds of millions of years long. These were startling, epochal ideas, and all came within a period of thirty years, creating for the world a fluidity of scientific thought such as had never been seen. The future came to life in the hands of novelists like Jules Verne, H.G. Wells and Aldous Huxley, not to mention the fabulous worlds of Robert Heinlein (who launched his terrific series of articles on the history of the future in the March 1941 issue of Astounding Science Fiction--just a month after John W. Campbell had evidently coined the term in the same magazine. I can't leave this without mentioning Edward Bellamy, a great trailblazer in this area of thought, and his work Looking Backwards, which was a view of a socialist utopia live din the year 2000 by an 1887 man who had fallen into a 113-year-long sleep. But the difficult part of multiple people living their lives backwards comes in the multiplicity of changes that would be caused by two actors adjusting their behavior for the "future" based on lives they had already "lived". I can't imagine the implications of the "butterfly effect" when spread across a broader spectrum than just Mr. Button. I haven't seen the movie, but I have now read the Fitzgerald story, and the idea is very disturbing, like coming out of Alzheimer’s to climb right back in again. The worst of it seems t take place not at the end of the reverse life, but right before--Mr. Button enters Harvard as a genius sportsman with his years of expertise and learning already under his belt--four years later, though, as a senior, he is struggling, his brain and mind slipping away, his knowledge restricted to that of a 16-year old boy. And it just gets worse from there, though his ability to distinguish his diminishing capacity grows dimmer and dimmer, thankfully, the closer he comes to his cradle grave. Its a difficult story to read. Yes, these two pamphlets are beautifully designed, real works of production art, speaking elegantly and skinnily to their skinny, elegant times. The World Behind the Telephone is a straightforward look at the stuff going on behind the scenes that made the telephone "go"--the woman holding the telephone is remarkably tall and angular, holding back the curtain of an even taller and skinnier doorway, beckoning the viewer into the unseen telephonic world. Poise and Personality features more skinny people, and offers the skinny on some excruciatingly class-conscious tips on expected behavior and the division of the classes. "Social poise does not consist of a mere set of mannerisms" it reads, but beware: "avoid careless and loose forms, which are in bad taste". There are all manner of pinkies-up logics and societal sniffing splayed throughout these pages, from the chapter improbably titled "Preccedence [sic] in Introductions", to "Sensitivenesses" ("being sensitive is a luxury and the price runs high"), "Inferiority Complexes ("if you are afraid of people, talk to them with a smile..."), "Personality development" ("undoubtedly there is a native something that differs in each of us"), "Poise" ("...people are unhappy because they are nervously conscious of a lack of ability to mix with strangers....consequently they are unable to appear calm and balanced". Yes, it is a product of its time. There are some troubling and insensitive things in here as well, pamphlet being delivered of it times or not. Letting the waiter pick up your fork is one; do not drop your ashes on the floor is another. The more subversive ones though are on dating behavior and gender wars, the subjugation of women as it was in 1938 firmly on display. "If you show interest in him, his interest in you is aroused." Oh dear sweet creator, the woman is only of interest to the man if she reflects his interesting bits back to him. Why not have the guy date a mirror? That way nothing will be lost in all of that wasteful biological differentiation. Here's an early classic on the subject: John S. Mill's On the Subjugation of Women, an oldie but still a goodie. Very little in common, no? It really is just an interesting set of images, really; I'd hate to think of this as anything approaching content analysis or anything besides this that might look like a "serious" attempt at comparing the two. I think of them in very simple terms, these two Wordscapes--like looking at two rivers, the one meanderingly serene, while the other looks more contentious, robust, challenging. 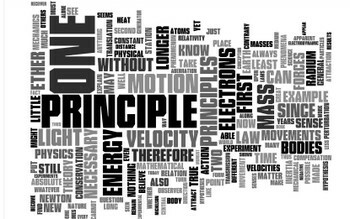 At the end of it all the robust Einstein river, unlike the beautiful if not sanguine Poincare river, rushes towards a Niagra; the Poincare, not. 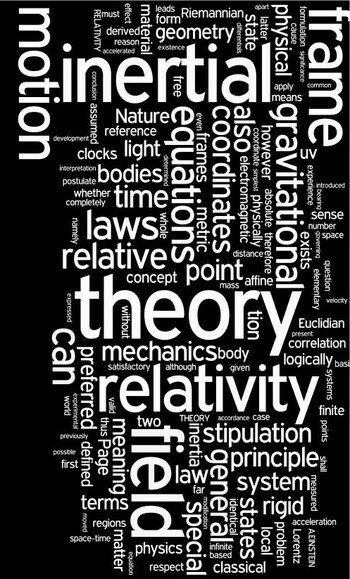 My thanks to Jeff De Cagna for the suggestion of Wordle-ing a favorite Einstein quotation--its a fine idea. What I've done is take 200 or so quotes and made one large file of them and fed it into the Wordle-izer with the following results (below) Again Wordle weights words in size according to the number of times it appears in a document, so the resulting image is a wort of word map, a lay of the land if you will of this collection of quotes, showing the words most often used by Einstein (at least in the quotes that I have selected). The longish quote list is below in the continue reading section(unfortunately without source attribution). Clicking on the image will enlarge it and make it clearer. It is interesting to note that the largest word here seems to be "can", followed closely by "one", which I think is really another way of his saying "you" or "us" or "we"--so, we get "you can" or "we can" or "one can", speaking to the possibility of possibility, of effort, of moving forward, of trying. Imagination, effort, thought, creation--that's what the man was all about, and I think that's what we see in this word map. 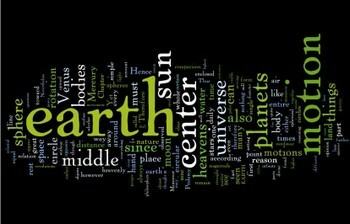 Here again is another Wordle treatment—this time we’ve fed it the first 10 chapters of Copernicus’ De revolutionibus orbium coelestium (On the Revolutions of the Heavenly Spheres). As usual Wordle offers a very interesting insight into word usage even though I was forced to limit the text selection to Book I and stop at the point where diagrams are used to illustrate the text. Be that as it may, even in this limited application, Wordle does surface some interesting bits from the relatively “popular” part of this revolutionary treatise. Tags: Copernicus, De revolutionibus orbium coelestium, On the Revolutions of the Heavenly Spheres. 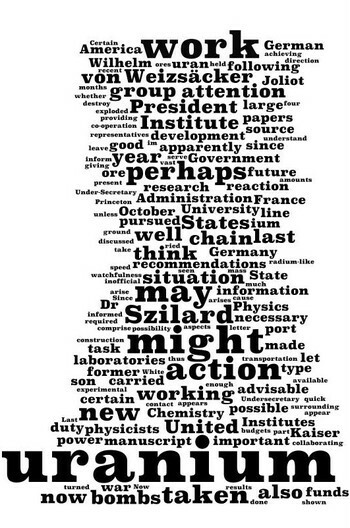 Einstein's delayed 1923 acceptance speech for his hideously delayed Nobel prize--finally offered to him in 1921 for his "work on the photoelectric effect" of 1905--is generated here into a piece of Found Word Art, fashioned by the language-generator residing in the WORDLE site. 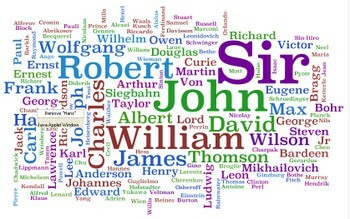 As in the other cases of word art generated by Wordle, the work is the product of the vocabulary-digester at Wordle, which in this case consumed the entire text of the speech and displayed it according to the appearance of the most popularly-used words. The results of these jaunts into Wordle have been fascinating to me, as I hope they are to you. 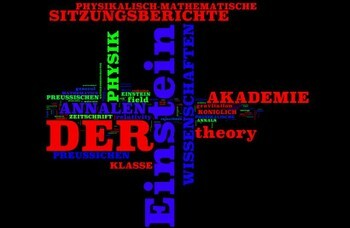 The full text of the Einstein speech (which is tricky to find in full text versions) is below. I'm sorry to say that I've messed up the equations, trying to fit them into typepad. Also you can click on the Wordle display to make it not only larger but clearer. If you click on the image it will become larger and clearer. The newest contribution to my new-found category of Found Word Art is constructed from the text of Albert Einstein's two letters (August 2 1939 and March 7 1940) to President Franklin Roosevelt about the use of the coming atomic weapon. 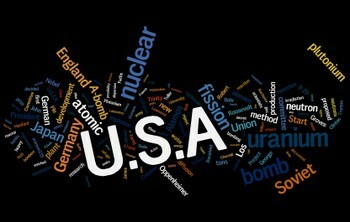 The text of the letters was simply deposited in the wonder-engine word-atomizer at WORDLE, and the relative distribution of the most commonly-used words were given new representation in relative sizes. 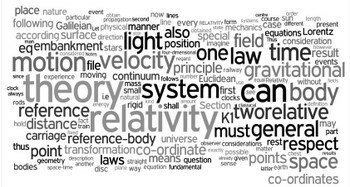 I should point out the earliest post I did on the cautionary letters of Einstein and Szilard to FDR and refer to it for the explanation the occurrences of some of the Wordle words. The complete text of the two letters is found below in the Continue Reading section. 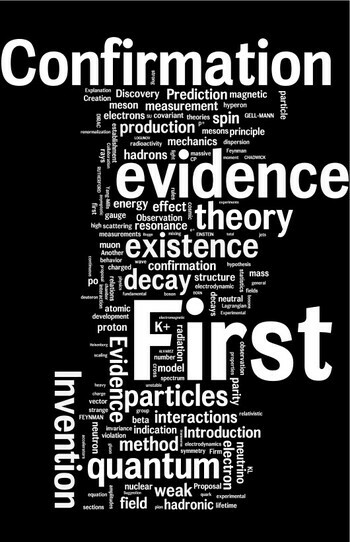 Up next in the expanding WORDLErama of creating FOUND WORD ART by dumping text blocks into the glorious WORDLE wonder-engine is my page devoted to the chronology of modern particle physics (1895-1995). The most often recurring words are the largest, which produces some interesting and unexpected affects and results. If you click on the image it will be larger and clearer. This is the newest installment of Found Word Art engineered by the good folks at WORDLE. 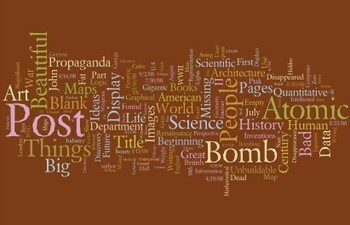 : this iteration uses the text block from my page on the chronology of the creation of the atomic bomb, with the entire thing dumped into the Wordle wonder-engine which produced this piece of art. I should point out that the size of the word refers to relative appearances of the word in the post. If you click on the image it will get larger and clearer. 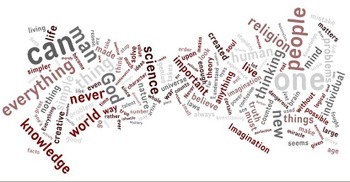 This is the newest piece of sub-art that was produced via the good folks at WORDLE : namely, it represents the dominant occurrence of a word in a text block on my page of winners of the Nobel Prise in physics via the its size in the one-page WORDLE summary, producing a pretty enjoyable and wholesome (!) bit of art. It also reveals some interesting pieces of info, like, the most common first names of all of the physicists awarded the Nobel prize (for physics). There are some little surprises here and there; mainly though its a nice thing to look at. If you click on the image it gets bigger and sharper. How cool is this? This is a wordle extravaganza applied to the page listing all of the titles in this blog: about 242 post titles of about 1500 words.